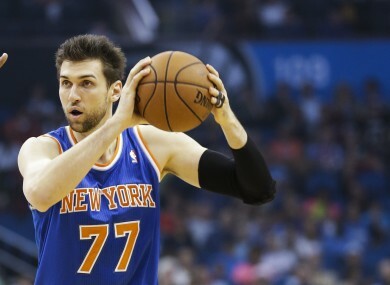 ANDREA BARGNANI IS well-known in NBA circles for all the wrong reasons. The Italian has struggled to find much support wherever he’s gone in North America. While in Toronto and playing with the Raptors, he was booed off the court by his own fans towards the end of his time at the Air Canada Centre. He then moved to the Knicks and was booed in his first home game. And then, to compound everything, he became a viral sensation at the end of his first season in New York thanks to his attempted dunk against the Sixers. Unfortunately, there were plenty more moments like the above, including when he inexplicably took on a three-pointer against the Bucks and his own team-mates (as well as his coaches) were all left open-mouthed by such a poor lack of judgement. But last night, his new team – the Brooklyn Nets – faced the Chicago Bulls and he conjured another jaw-dropping play. Just watch the reaction of his coach, Lionel Hollins, who can’t quite believe what he’s just seen from a top-level, elite NBA player. Email “The NBA's most-hated player produced a moment so bad that his coach basically cried ”. Feedback on “The NBA's most-hated player produced a moment so bad that his coach basically cried ”.